I've been to my fair share of beer pairing dinners but the one at The Commons Brewery was the first time I've been to one where the brewery was transformed into the dining space. 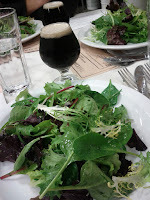 What didn't change was that the food and the pairings were superb. 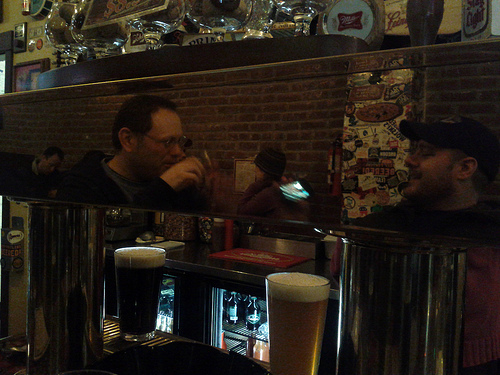 The liquid works from Mike and Sean were accompanied by food stylings from Ben Meyer of Grain & Gristle. 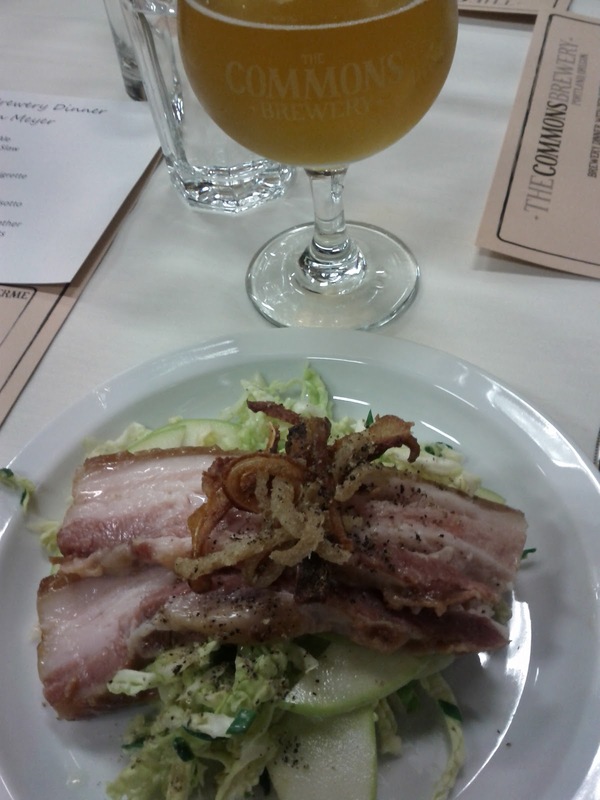 Pork Belly with Winter Slaw paired with Urban Farmhouse Ale: Farmhouse ales are not a preferred style of mine however The Commons' version, as with Lift Bridge's Farm Girl, is very drinkable. 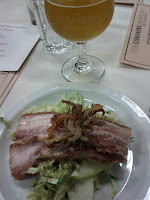 When paired with this salad it was an amazing compliment to the rich deliciousness of the pork belly. In addition to the cabbage, local apples made their first appearance of the evening. And do you see the pile of crunchy bits atop the salad? Those delicious bits came from all areas of the pig and were fried to perfection. Gathered Greens with Rosehip Vinaigrette paired with Fleur de Ferme: While the salad may not look particularily interesting, the variety of greens provided multiple textures and the vinaigrette, made with tarragon-infused vinegar and honey from Ben's wife, among other things, provided multiple layers of flavor. Fleur de Ferme is one of my favorites from The Commons and although dark in color, stays light from the hibiscus, lavender and chamomile used. 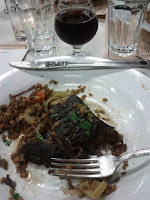 Braised Short-Rib with Heady Wheatberry Risotto paired with Sticke: The meat was fall apart tender and perfectly seasoned, complimented by the al dente wheatberries, a current favorite grain of mine. Although the portion size was generous and by the end I was filling up, had another serving been set in front of me I don't think I could have resisted eating it, too. It was that good. The Sticke, a German special style alt, is generally a little too sweet for me but here stood up very well to the flavorful meat. Steve's Choice Cheese with Select Accompaniments paired with Little Brother and Aged Little Brother: Serving me cheese is a guaranteed win and this sheep-cow blend from award winning Cheesemonger Steve Jones, went wonderfully with both versions of Little Brother. The aged version, which spent two months in Heaven Hill barrels, was absolutely heavenly. I was secretly hoping one of my dining companions would prefer the non-aged version so I could offer a trade. Alas, at our end of the table the aged version was the hands down winner. The "select accompaniments" brought a return of apples, prepared two ways: the first was pickled, which may sound odd but was surprisingly delicious, and the second was combined with some lovely bacon. 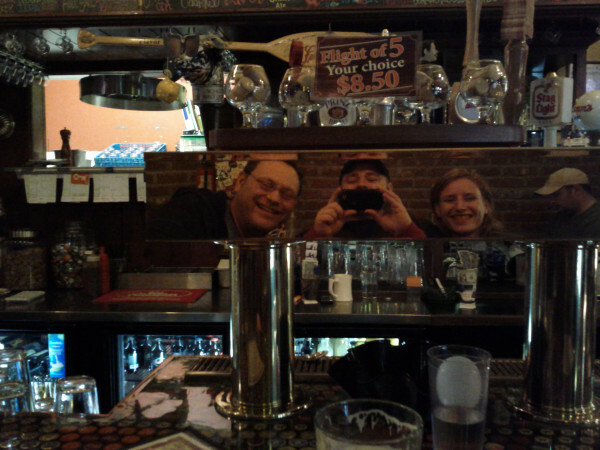 A delightful evening all around and one I'm hoping to repeat. So The Commons, please plan another feast soon! 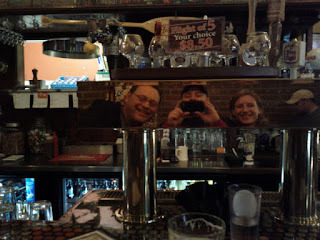 Those that know me well know I drink three beverages: coffee, water and beer. If it was an option, I’d happily swap out my morning coffee for a nice coffee beer some days but…well…the current employment situation would frown upon that. So instead, it’s straight up hot, black caffeine in the morning with the cold, hoppy (sometimes) caffeine once I’m off the clock. That said, I am a huge fan of the brews that can combine two of my three beverages (all three I suppose if you factor in the water content of both coffee and beer) into a product that is greater than the sum of its parts. 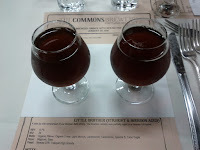 When I got the notice from Lompoc last week that they were not only releasing Black Dawn III, but three versions of it AND would be pouring Black Dawn II and 2009 Pre-Dawn Imperial Stout I was pretty excited. 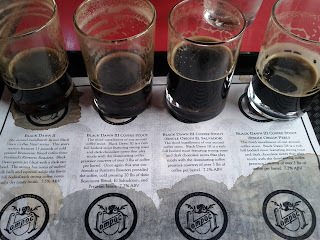 I wasn’t able to make it the day of the release so I missed out on the Pre-Dawn (described as a “coffee-less imperial stout”), leaving me with four coffee beers to try. 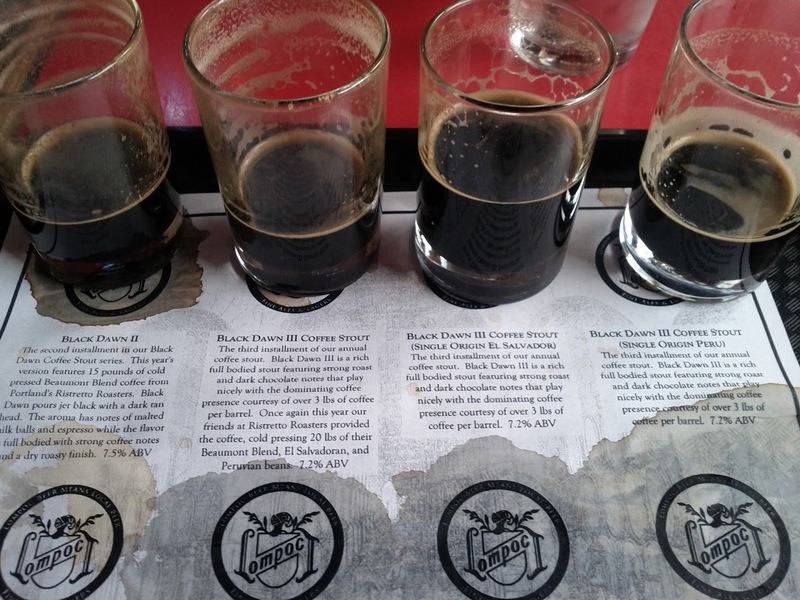 Each of the four poured with a great, creamy head and beautiful black color. I couldn’t wait to start in on them. - This beer had the most aroma (once it warmed), was full in body and in flavor without any coffee or chocolate malt bitterness. - The aroma was of bitter coffee, with a more pronounced chocolate flavor than BD II yet still resisting any bitterness in the flavor. - This beer was more stout than coffee but exceptionally good and drinkable. - Initially this had the most pronounced coffee aroma (which faded as it warmed) but strangely, the weakest coffee flavor. While providing excellent mouthfeel, the coffee flavor that there was carried the most bitterness of the four. In my book, all four were solid, drinkable coffee beers. 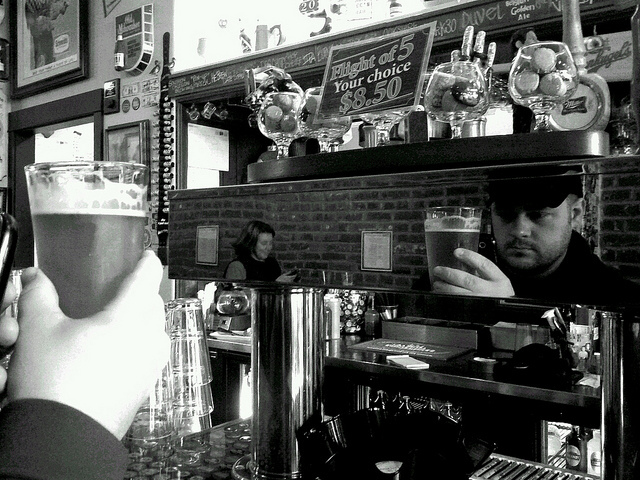 As for which one I’d recommend, that depends on how you like your coffee and how you like your beer. If you want more beer than coffee, either the El Salvadoran (if you’re feeling stout-y) or the Peruvian (if you want a smooth, light body). If you want a greater coffee kick to your beer without bitterness the Black Dawn II or the triple blend (if you want more pronounced chocolate) will serve you well. I’d quite happily take any of the four set in front of me. I appreciate clever names so when I heard Cascade Brewing Barrel House was having a vertical tasting called “4 Goses of the Apuckerlips” I knew it was something I needed to go to. 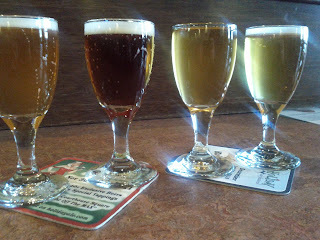 The tasting consisted of Spring and Winter Goses from 2011 and Autumn and Summer Goses from 2010. I wasn’t able to go the first night it was offered, but thankfully neither was enough other people, and there was still some of each beer left the next day. Although each was only two ounces, I made my way back and forth through the seasons multiple times and in doing so the story of The Three Bears came to mind. Instead of being too hot or too cold, too soft or too hard I found the Spring to be too floral and the Autumn and Winter to be too spicy. But the Summer, the Summer was just right. The Autumn and Winter both grew on me and improved as they warmed but it was the Summer, a subtly sour wheat beer, that won it for me. Hops, the ingredient that provides the delicious bitterness in beer, are generally grown intentionally. Commercially grown in large fields, planted on the patios of breweries to provide visual interest (and even shade once they really get established) and by home brewers with enough motivation to provide a nice climbing structure so there will be enough cones to harvest and use. Come harvest time, down come the bines and that’s usually the last we see of them until they become part of a beer. About that time, harvest time, I happened to realize, after months of walking by the same spot again and again, that there was a patch of “abandoned” hops doing their thing on the street side of a fenced yard and continuing their thing up a nearby utility pole. After that I’d look for them each time I went by, interested to see if anyone would claim/harvest them. One day, when it was clear they were indeed abandoned, I picked a couple, relishing the fresh hop aroma. Now that it’s winter they’re easier to see, as they’ve gone brown, contrasting with the other weedy vines they’re cohabitating with. And while it’s too bad they never found their way into a brew kettle, it’ll give me something to look for on that corner when spring comes, when they’re still in stealthy, svelte, vine-only mode. I’ll also be keeping my eye on this patch of what I’ve dubbed “neglected” hops. They can’t really be called “abandoned” since whoever lives in this house must see them from time to time, even though it’s clear they weren’t interested in using them. Do you have any abandoned or neglected hops hanging out in your area?